The Vapemate Classic range is a UK conceived and manufactured vape juice range featuring a range of both classic and unique flavours. Each Vapemate Classic e-liquid comes in a 10ml bottle with a VG:PG ratio of 50:50, making them perfect for mouth to lung and low wattage vapers who prefer flavour to large clouds of vapour. Vapemate vape juices are manufactured in the United Kingdom, using ingredients produced either in the UK or the EU. 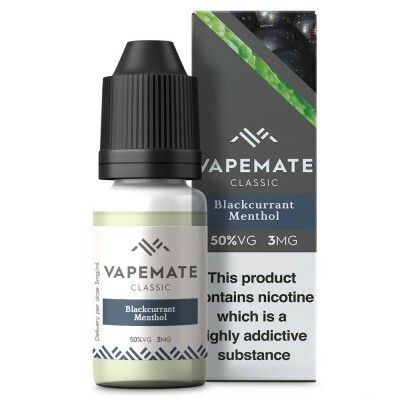 The Vapemate Classic and Origins range include a huge range of flavours. Here’s a small selection of what’s available to get your taste buds going! RY4 tobacco: What goes perfectly with tobacco flavours? Caramel. RY4 is the name for this popular combination, while with Vapemate’s RY4 you’ll find just a touch of chocolate and vanilla to add to the classic RY4 taste. Tobacco flavours: As is appropriate for a classic range, tobacco flavours are not forgotten! You’ll find plenty of choice in this flavour, including Amber Blend Tobacco, Virginia Tobacco, Havana Cigar, American Gold Tobacco, American Red and more. Following the success of the original classic range, Vapemate Origins was created with the new vaper in mind, and is designed to provide a introduction to the exciting world of vaping flavours. In practice, this means that many of the flavours feature a simple and straightforward flavour profile, avoiding the complexity of tastes offered by many other e-liquid brands. 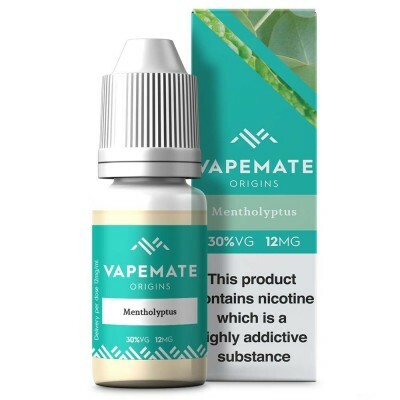 Many new vapers prefer to start with a tobacco or menthol flavour, and Vapemate Origins delivers the goods here with simple Virginia and Menthol flavours. 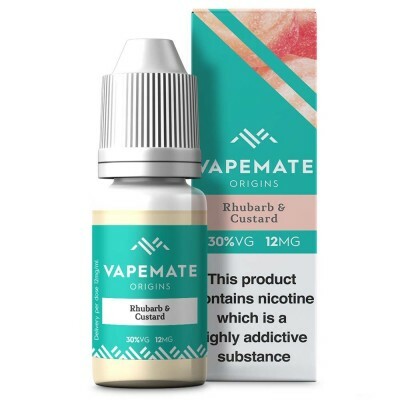 However, if you are new to flavours we always recommend experimenting with different flavour profiles, as the more you get into flavours the less likely you are to be tempted back to smoking. 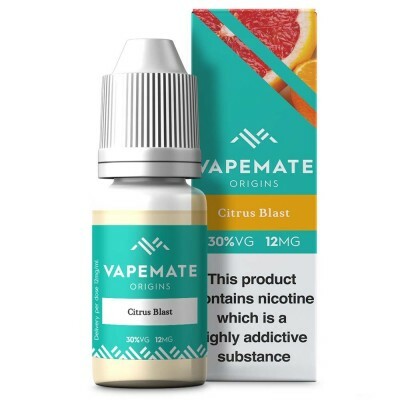 For fruit lovers, you might want to try Raspberry or Blueberry, or, for a sharper taste, Citrus Blast. 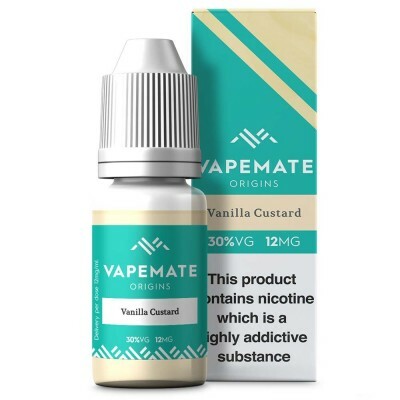 If you prefer dessert flavours, have a drag on the classic dessert flavours - Vapemate offers the choice between Rhubarb and Custard or Vanilla Custard. 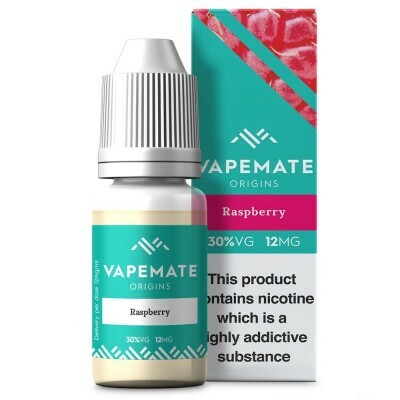 Origin e-liquids are made with pharmaceutical grade nicotine, and come with VG: PG ratio of 30:70. The higher PG ratio means they are best used with low powered devices and provide a stronger throat hit more similar to that of a cigarettes. Learn more about VG:PG ratios here. Each e-liquid comes in a 10ml bottle, and is available in a range of nicotine strengths. All bottles are child proof, tamper evident and come with a leak free refilling tip. Vapemate e-liquids have been pre-steeped to ensure that they are ready for vaping. Vapemate are designed for vapers who want a stronger throat hit and a tighter draw, using low powered electronic cigarette devices with high resistance coils. 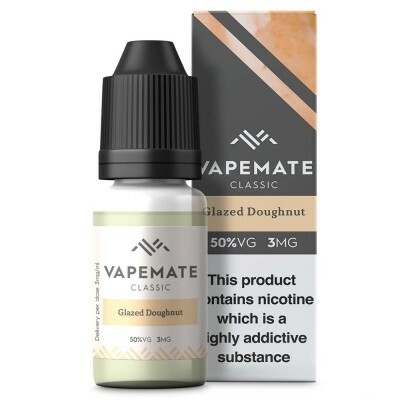 They are not ideal for vapers who prefer a smoother throat hit. Vape Mate is one of the cheaper vape juice ranges, and is ideal for the budget conscious vaper. For an even better price take advantage of our multi-buy offer - 3 juices for £8.37 (that’s just £2.79 each).